Havana Club 15 Year Old Gran Reserva Rum is a popular Rum available from DrinkSupermarket.com in 70cl to buy online. Visit DrinkSupermarket.com for the best price for 70cl of Havana Club 15 Year Old Gran Reserva Rum or compare prices on our other Rum products. Havana Club Rum 15 Anos Gran Reserva was created by selecting the best quality reserve rums of Cuba. It is the result of a lengthy and complex aging process, which has produced a rum with a flavour, that will please even the most particular palates. Where to buy Havana Club 15 Year Old Gran Reserva Rum ? 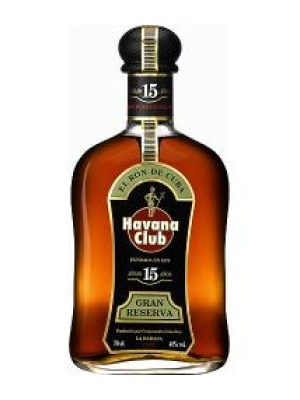 Havana Club 15 Year Old Gran Reserva Rum Supermarkets & Stockists. You can buy Havana Club 15 Year Old Gran Reserva Rum online in most retailers and find it in the Rum aisle in supermarkets but we found the best deals online for Havana Club 15 Year Old Gran Reserva Rum in DrinkSupermarket.com, TheDrinkShop, and others. Compare the current price of Havana Club 15 Year Old Gran Reserva Rum in 70cl size in the table of offers below. Simply click on the button to order Havana Club 15 Year Old Gran Reserva Rum online now.